If Bobby Flay calls you a lifesaver in the kitchen, you must be doing something right. At the Food Network & Cooking Channel South Beach Wine & Food Festival (SOBEWFF®), students are often the ones behind the curtains making sure the star-studded, destination event runs smoothly. “The students at FIU, they’re lifesavers for us,” celebrity chef and restaurateur Bobby Flay told FIU News at the 2018 Festival. SOBEWFF® Founder and Director Lee Brian Schrager says the massive festival could not happen, on any level, without its volunteers and staff. Eighteen years ago, SOBEWFF® was a one-day festival held at FIU. In 2018, the Festival drew more than 60,000 attendees. 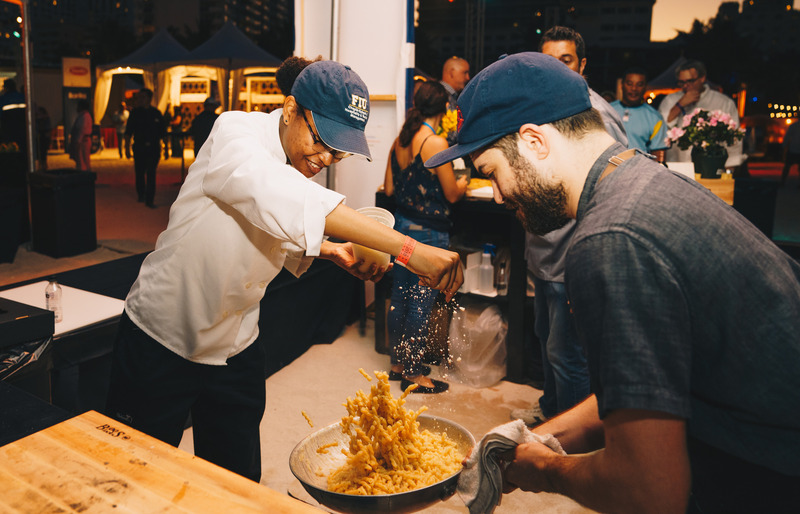 This month, Feb. 20-24, SOBEWFF® will host more than 100 events over five days, thousands of cases of wines and spirits — and literal tons of food. 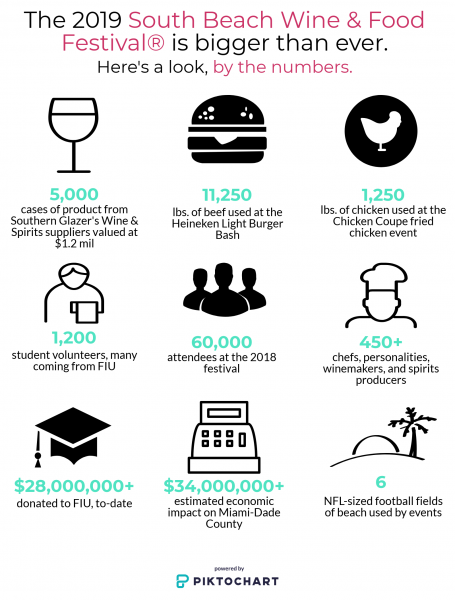 Roughly 1,200 student volunteers — many from FIU — will help cook, greet and host festival guests, as well as help keep the wheels turning behind-the-scenes for plethora of events. Mohammad Qureshi, associate dean of the Chaplin School of Hospitality & Tourism Management, has volunteered with the festival since its beginning days, even before it was called SOBEWFF®. He now works as the dean’s office liaison for SOBEWFF® and the university. He says student volunteer numbers are up compared to previous years. In the past, only hospitality students from FIU were recruited. As the festival grew, it became difficult to staff all the events. Then, it was open to hospitality students throughout the area. Now, it is open to all FIU students — and the results are expected to be prolific. Of the volunteer workforce, three-quarters of jobs fall into the hospitality category — greeters, ticket scanners, handing out water bottles throughout the day. More than 80 festival committee members and internal staff also spend months preparing for and steering the ship at the five-day event. Qureshi said that volunteers positions are open to all students, and volunteers have the opportunity to choose where they’d like to be placed. But about one-fourth of volunteers are culinary positions — and these are usually reserved for the pros. When it comes to events, Schrager said that keeping it fresh is as important as keeping it moving each year. Regular festival-goers can count on signature events such as the Burger Bash, but he says organizers try to bring in some surprises each year. The 2019 festival will incorporate new events, new chefs, new venues and new music. The intimate dinners series allows guests to eat and meet with distinguished chefs in smaller settings. Curating the pairings of chefs takes some careful thought, Schrager said. Organizers won’t always pair Asian chefs with Asian dinners, or French chefs with French dinners. Pairing these chefs can switch things up, as well. For some talent, Schrager said, the SOBEWFF® team will ask for some input from chefs on who they’d like to work with. For others, Schrager a spark of inspiration can pair two chefs who’ve never worked together. “We try to use a lot of new talent, and bring in interesting chefs who’ve won national and regional awards, or are well-known in their communities,” he said. They bring talent from across the spectrum — of the roughly 100 chefs coming to SOBEWFF® to be part of its intimate dinner series of events, at least one-third of them have never participated in the festival. “We don’t always do what is predictable,” Schrager said. Click here to learn about discounts available to the FIU family on tickets to Miami’s premier gourmet gathering.